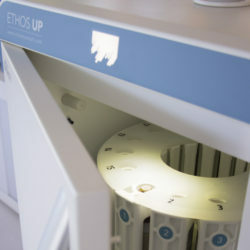 The ETHOS UP & ETHOS EASY microwave digestion systems fully embody Milestone’s philosophy in microwave sample preparation. Specifically designed for closed vessel acid digestion, they offer a perfect integration between microwave hardware, user interface, reaction sensors and pressure vessels. With a comprehensive choice of accessories, they additionally offer a complete first-class solution for microwave solvent extraction, organic and inorganic synthesis, protein hydrolysis, and vacuum evaporation. The two systems have a microwave cavity in excess of 70 litres, the largest currently available. 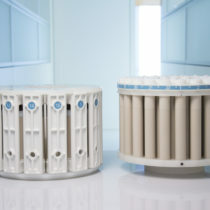 This enables digestion rotors with more sample places for improved laboratory throughput, and an added degree of safety should any venting take place from vessels during a digestion run. Equipped with two 950 Watt magnetrons the systems can operate at up to 1900 Watt making them the most powerful systems available. Additionally, a rotating diffuser evenly distributes the microwaves throughout the cavity enabling very fast heating and the complete digestion of the most difficult samples. 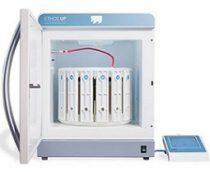 Three rotors offering both high quality digestion and high sample throughput are available for the ETHOS systems. The SK-15 is a high-pressure rotor featuring up to 15 vessels, the MAXI-14 and MAXI-44 are medium pressure high-throughput rotors featuring up to 14/44 vessels. Highest safety is ensured with a reaction sensors including temperaure. 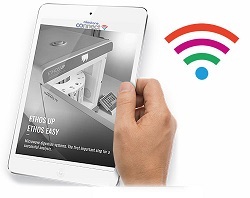 The ETHOS systems are controlled via new compact terminals with an easy-to-read, bright, full-colour, touchscreen display. The terminals run a completely new user-friendly, icon-driven, multi-language software to provide easy control of the microwave run. Simply recall a previously stored method or create a new one, press ‘START’ and the system will automatically follow the user defined temperature utilising a sophisticated PID algorithm. Hundreds of applications, including all US EPA methods, are already preloaded. There is no need to input the number of samples or weights being digested, as the software will automatically regulate the microwave power accordingly. This assures a consistent quality of digestion and simplifies the use of the instrument. Included with the ETHOS systems is a unique web based application – Milestone Connect. 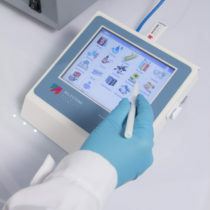 The app provides up to date information and extended instrument monitoring from outside the laboratory of every sample in the digestion run that ultimately helps to provide high quality sample preparation. The app works on various external devices such as PC, tablets or smartphones. The integral database includes specific and detailed information on the installed equipment (list of parts, technical notes, user manual, video tutorials, etc), continuously updated application notes, a library of available scientific articles published in scientific magazines, and a help-on-line section that provides instant support available 24 hours a day, 7 days a week. The systems feature a full stainless steel door with an innovative opening and self-resealing mechanism. Should there be a sudden overpressurisation of the cavity, the door slightly opens for rapid and safe pressure release and the microwave power is instantaneously cut off. Immediately afterward, the door is pulled back, resealing the cavity. For additional safety, an automatic door locking system does not allow the user to open the door during the microwave run. At the end of the run, the door remains locked until the solutions have cooled down to a user preset temperature. This prevents misuse of the instrument and in turn exposure of the chemist to high pressure vessels.